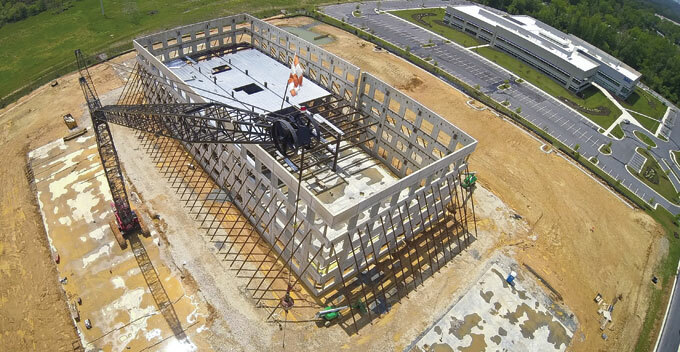 A four-story tilt-up office building designed to meet the Department of Defense’s blast and progressive collapse resistance requirements is under construction in Maryland, and it is being built on a speculative basis. Before diving too far into the specifics of this project though, it is helpful to discuss what exactly blast and progressive collapse resistance means and where these requirements originate. Just as constructing a building to completely withstand a direct hit from an EF5 tornado or a magnitude 7 earthquake can be impractical from a cost standpoint, designing a building to provide comprehensive protection against the range of possible terrorist attacks may also be cost prohibitive. What we do however, through building codes and standards, is provide a reasonable level of protection at a reasonable cost. The definition of reasonable in all of these cases can be somewhat complex. To address this issue, the Department of Defense (DoD) and military services initiated a program to unify all technical criteria and standards related to the planning, design, construction, operation and maintenance of DoD facilities. As part of this unification, the DoD published a series of Unified Facilities Criteria or UFC. UFC 4-010-01, DoD Minimum Antiterrorism Standards for Buildings, was published in July of 2002 and updated to its current version in February of 2012. The overarching philosophy on which UFC 4-010-01 is based is that an appropriate level of protection can and should be provided to DoD personnel to minimize the likelihood of mass casualties from terrorist attacks on buildings owned, leased, privatized, or otherwise occupied, managed, or controlled by or for DoD. Mark P. Gardner, P.E., Managing Engineer for Hinman Consulting Engineers, Inc. provided blast consulting services for the project and helped to summarize the documents outlining these requirements. “These standards assist designers in determining the proper level of protection for DoD buildings where no specific threat has been developed,” explained Gardner. In other words, they establish ‘reasonable’ and prescribe methods for achieving a certain level of protection. The document identifies three key elements as having a major influence on the implementation of these standards: time, master planning, and design practices. Obviously, for these protective measures to be effective, they need to be in place before an attack. That is one facet of the timing issue. The other is that it is most cost effective to implement these strategies during the initial construction period. Therefore, many of the decisions made during the master planning and design stages of development directly affect the building’s potential for disaster resistance. Some of these decisions, when informed, can improve the project’s potential with little or no cost implication, hence their extreme importance. Other modifications to a development’s master plan or a building’s design carry cost implications, which necessitates the balance between reasonable protection and reasonable cost. Part of UFC 4-010-01 is aimed at identifying and qualifying what is an appropriate or acceptable level of damage/loss. Table 2-1, Levels of Protection – New and Existing Buildings (UFC 4-010-01) outlines the varying levels of protection and the potential building damage/performance associated with each level. The table also presents the resultant potential injury. In the case of AJBP7, the subject of this article, a medium level of protection was provided. According to Table 2-1, a building designed to this level of protection would potentially experience minor, economically repairable damage resulting from an attack of given magnitude. Occupancy Category III includes both an Alternate Path (AP) requirement and an Enhanced Local Resistance (ELR) requirement to resist progressive collapse. The Alternate Path (AP) method is described in the document as often being the most practical approach for load-bearing wall structures. Basically, this method requires the structure immediately adjacent to the affected area to be able to transfer loads around the affected area down to the foundation, thereby isolating the failure and avoiding the spread of damage. The Enhanced Local Resistance (ELR) requirement for Occupancy Category III calls for the shear capacity of each wall, and its connections to the building diaphragms, to be greater than the flexural capacity at the first floor to prevent a brittle failure at the lowest level. Gardner’s work and interest in applying these standards to tilt-up concrete construction are nothing new. The design team for AJBP7 has been studying these issues for years. AJBP7, a joint venture between Konterra Realty and Boston Properties, is a product of extensive research into new Anti-Terrorism Force Protection (AT/FP) applications of tilt-up concrete construction conducted by Hinman Consulting, Powers Brown Architecture, Haynes Whaley Associates and Harvey-Cleary Builders. Tate Armstrong, President at Konterra Realty LLC, echoed the team’s enthusiasm over the potential for tilt-up in this market. “This construction technology lends itself to blast cost efficiency.” Typically, the only way for an investment like this to make much sense is to have a tenant requiring this performance. With the savings afforded by tilt-up both in cost and schedule, Konterra was able to pull the trigger without the security of a tenant requiring AT/FP. “This is a long-term investment for us,” explained Armstrong. The target market for the project is a government user group or a third party intelligence community or defense contractor. However, according to Armstrong, that tenant could end up being the second or third tenant to lease the space. In that case, AJBP7 is ready. “You have got to be flexible to meet the needs of this market,” said Armstong. AJBP7 is part of a larger campus of buildings of similar performance capabilities. Armstrong explained that AT/FP is the theme of the development. The project is located in Annapolis Junction, an unincorporated community in Anne Arundel County, Maryland, just a short distance from Fort George G. Meade. A United States Army installation, Fort Meade is the Nation’s preeminent center for information, intelligence and cyber security. Another theme of the development, as Armstrong described it, is quality. As owners with long-term interest in the development, part of Konterra’s reasoning for employing tilt-up was the level of durability and flexibility they could expect from tilt-up concrete construction. The project is a pioneer in the four-story progressive collapse tilt-up market because it has no perimeter columns. This is a great benefit affecting the efficiency of interior space planning. 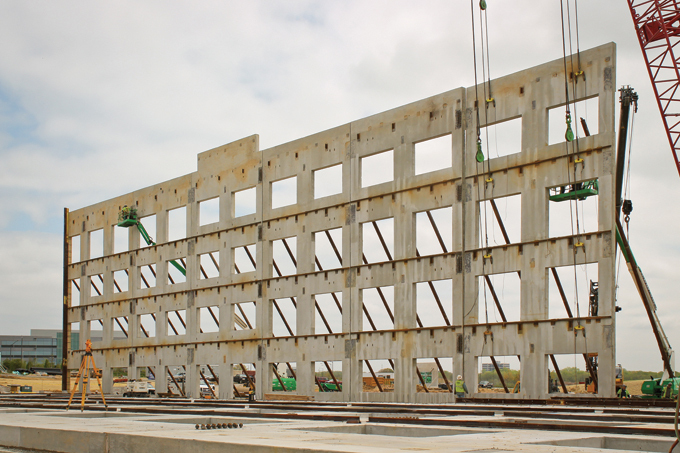 AJBP7 consists of 32 tilt-up concrete panels, typically 30 ft wide and 64 ft tall. The tallest panel on the job is 68 ft tall and weighs 125 tons. “We built a four-story tilt-up project recently in Houston with 9½-in-thick panels,” said Matt Armentrout, Harvey-Cleary Builders. “The panels on this project averaged 15 in thick.” For this project, the minimum panel thickness was determined to be 11 in for blast and progressive collapse resistance. Architectural features such as ribbon windows that pass in front of panel legs required 4-in recesses of the exterior face of the panels, thereby increasing the overall thickness of the panels to 15 in. In some cases, a four-story tilt-up building could be composed of three-story panels with one-story panels stacked on top. In the past this was done in part to accommodate crane capacities and bracing logistics. Some five-story tilt-up buildings are now being constructed in a similar fashion. In this case, issues of continuity and efforts to keep panel joints at a minimum made going with four-story panels an easy decision. Haynes Whaley Vice President Tom Heffernan, P.E. and Associate Brian Barna, P.E. worked closely with Gardner throughout the project. The design for blast and progressive collapse resistance starts at the foundation. The foundation was designed for several different loading conditions because of the progressive collapse requirements. “We had to be sure that the foundation could handle the load if one of the panel legs was knocked out and that load was transferred to a different point,” said Heffernan. Rather than a series of spread footings at the panel joints, a continuous footing was designed to support the perimeter walls based on the large progressive collapse loads and the reliance on the interior panel leg to transfer loads in a progressive collapse scenario. 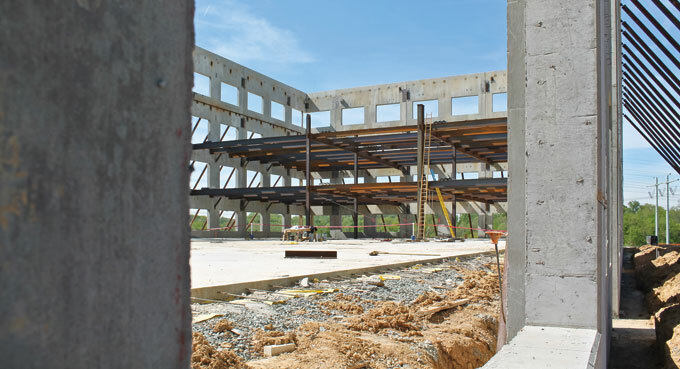 To aid erection, panels have bearing channels at each end which connect to bearing plates that are anchored into the foundation. The 30-ft module for the panel width was driven by the progressive collapse requirements. Barna noted that limiting panel joints, thereby limiting instances of discontinuity that would need to be bridged with large steel connections, was a driving factor in this decision. Dowels cast into the wall panel are lapped with reinforcement of the first floor building slab along the entire perimeter of the building in a 10-ft area (dimensions vary on each project) commonly referred to as a pour strip. Once the panels and interior steel columns have been plumbed, this strip is backfilled and concrete is poured to extend the slab to the face of the panel and tie the reinforcement together. This is a typical detail for a conventional tilt-up project; however, for this project the dowels were enhanced to resist tension from a blast force attempting to pull the panel away from the building during the rebound response of the panel during the blast-wave. For this same reason, the connections of continuous deck edge angles at each elevated floor to embedded plates in the wall panels were enhanced. “For a conventional project, these connections are designed to brace the panels at each floor, take out of plane lateral loads, and act as collectors to transfer lateral loads to panels acting as shear walls,” explained Barna. “In this case, these connections are also designed to resist out-of-plane panel loads caused by blast forces.” Three kickers per panel per floor just above the window head also help to tie the panels back to the diaphragm to distribute both blast and progressive collapse loads. Lightweight concrete on metal deck was used at each floor level to reduce the progressive collapse load by reducing the weight of the structure. Due to downward pressures from blast loads, the roof structure consists entirely of steel beams instead of a more typical open-web steel joist system. Beams were spaced similarly to the floor beams at intermediate levels; therefore, a 3-in deep steel deck was used to accommodate the longer span between supports. Perhaps the most atypical element of the design is the panel-to-panel connections. Traditionally, tilt-up panels are not connected to one another except for perhaps at the corners of a building. 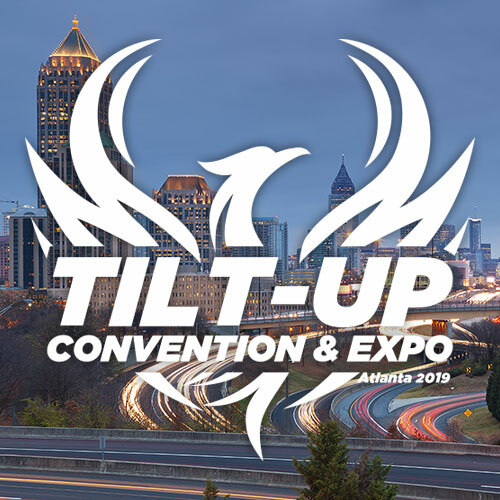 In older tilt-up structures where connecting panels was more common, concrete’s coefficient of shrinkage and basic thermal movement often caused these connections to either fail or damage the concrete wall. Because of the Alternate Path requirement for this project, the design team utilized large plates spanning across panel joints and connected to embedded plates in each panel to tie the structure together. These plates allow load to be transferred across joints in the event of a damaged section, keeping the destruction from spreading to other parts of the structure. There are four embedded plates on each side of each panel, eight total. The incredibly large embedded plates, each up to 5 ft tall x 18 in wide with up to 20 headed studs, weighed on average 300 lbs and had to be set by mobile crane. The panel connections alternated between a connection plate welded to the embedded plates on each side of the joint and a connection plate welded to the embedded plate on one side of the joint and fastened with a bolted slip connection on the other side of the joint. This alternating pattern continued around the building, allowing for in-plane movement of the panels. According to Bean, the amount of reinforcement throughout the panels also presented the challenge of ensuring complete consolidation which was done utilizing various types of equipment, depending on the location within the panel. Beyond the complexity of the reinforcement, the only other aspect of the process Bean was especially concerned with was the marrying of the joints between panels. The joints between panels typically match due to the utilization of common forms. However, “Due to the location of the casting beds, the path of the crane and other factors, we could not lay all of the panels out in sequence and therefore could not utilize common forms for some of the facing panel edges,” explained Bean. “With the height and thickness of these panels, that was a concern.” It turned out not to be an issue and everything lined up perfectly. With an average panel thickness of 15 in, simple dimensional lumber could not be used by itself for forming. Southland prefabricated 16-ft sections of form using dimensional lumber faced with medium density overlay. Making sure these forms stayed plumb throughout the process was critical to the success of the erection process. The large openings did not, however, reduce the weight of the panels enough for the crane available for the job. To reduce the weight further, Haynes Whaley specified lightweight concrete. According to ACI 318 Appendix D, the move to lightweight concrete comes with a 25 percent reduction in capacity for headed stud anchors for the embedded plates. To counter this and keep the size of the embedded plates manageable, the team used 6,000-psi concrete for the tilt-up panels to increase the connection capacity for the Appendix D limit states and compensate for the reduction. Bracing the four-story panels to the inside of the building would have presented multiple challenges. Mainly, they would create a space too tight for the efficient erection of steel. Initially, Harvey Cleary budgeted and planned for continuous strip footings at the outside of the building to which they would brace the panels. Once the braces were removed, the plan was to bury the strip footings and leave them in place. When the owner requested the footings not be left in place, the potential unbudgeted cost of removing the footings forced the contractor to consider helical anchors. “At first we were very skeptical about going with helical anchors on this project due to a lack of familiarity,” explained Mark Tillotson, Sr. Project Manager for Harvey-Cleary Builders. “Given the height and weight of these panels, we were not necessarily interested in trying something new. We wanted to stick with what we were used to, what we knew worked.” After consulting with Meadow Burke (manufacturer of helical anchor system) and learning more about the system, the project moved forward with helical anchors. The project is seeking LEED Gold Certification for the core and shell. Steps such as recycling the casting slabs and using other recycled concrete as backfill for the pour strips contributed to the effort. LEED Certification is just one added element of quality to the project that reinforces Konterra Realty and Boston Property’s long-term interest in the project. Numerous challenges were faced on this project; collaboration, planning and persistence overcame them. The structure serves as a testament to the versatility, economy, and strength of tilt-up as a building system to meet the divergent needs of a wide array of building requirements. Founded in Houston in 1976, and with offices in Reston, Virginia and Austin, Texas, Haynes Whaley Associates offers structural engineering services for a broad range of commercial, public and institutional projects. We work nationally, with projects in 40 states, the District of Columbia and international locations. As a firm focused solely on the structural engineering of buildings, our primary goal is to accomplish the architect’s design while maintaining the owner’s budget and schedule requirements. We support this mission by upholding a spirit of collaboration among all team members throughout the design and construction process. 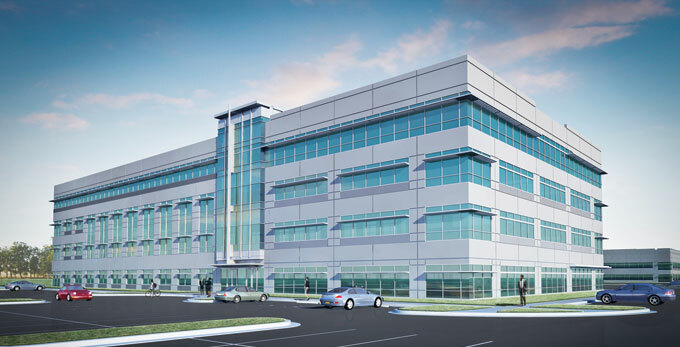 Haynes Whaley is considered a leader in designing structural systems for tilt-up office and industrial buildings, with more than 150 million square feet of project experience. These projects range from 20,000 sf to more than 1,000,000 sf and have been designed to achieve each owner’s goals for cost efficiency, functionality and maintainability. Since the formation of Harvey in 1957 by David Harvey, Sr. and Gerald D. Hines, the company has rapidly grown to be a recognized leader in the building industry, amassing a portfolio of the most impressive buildings in Houston, Texas, as well as our other markets. Being client-oriented rather than market-oriented, we have grown from our Houston base and now have had offices in Washington, D.C. since 1986, Austin, Texas since 2001 and San Antonio, Texas since 2007. This has allowed us to become the builder of choice by many distinguished clients on both a local and national level. Accidents happen. Terrorists are real. And hurricanes don’t care. But Hinman cares. We are committed to helping clients find the best solutions to protect people and property from catastrophe, disaster and extreme events before they happen. Hinman delivers custom, holistic solutions—through focused attention and service, balancing risk and cost goals. With nearly eight decades in the manufacture and development of accessories for the concrete construction industry, we’ve practically done it all. Over the years we have developed over 50 patented products contributing to every segment of our industry. Sure, it takes people with the technical ability and engineering skills to design products, and yes, you must have a talent for quality manufacturing to execute ideas. But, the companies that are willing to hear the wants, needs and desires of customers and translate them into working solutions are innovators indeed. They are the people that recognize that the cost of complacence is far greater than the price of creation. Powers Brown Architecture is a Houston-based professional services firm practicing award-winning architectural, interior and urban design regionally, nationally and internationally. The firm draws on a depth of experience embodied in its founding principals and employees who have collectively encountered and successfully solved a variety of client and project types including Commercial / Developer Investment Grade and Private Owner Office and Industrial, Public / Governmental Facilities, University and K-12 Educational, and Healthcare. Southland Concrete is recognized throughout the construction industry as a leader in concrete subcontracting as evidenced by the continual repeat business and negotiated nature of the subcontracts we are awarded. We are a large growing company with a small company mentality to maintain the necessary attention to customer service, customer and supplier relations, and above all quality, safety, and timely completion of all projects. There is no doubt why Southland Concrete is the subcontractor of choice and will continue “Setting the Pace” for many years to come. This is one of the best articles and videos of modern-day Tilt-Up construction that i have seen. If there are any owners, be them from the private sector or public sector, who are considering new building structures, i would strongly suggest that this article and video is read. 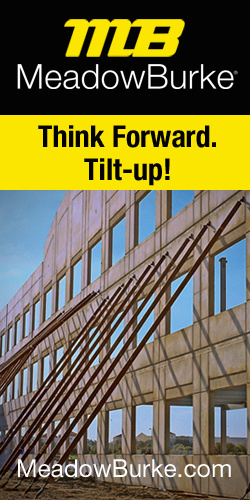 Tilt-Up concrete construction has proven itself in the past but it is the wave of the future!